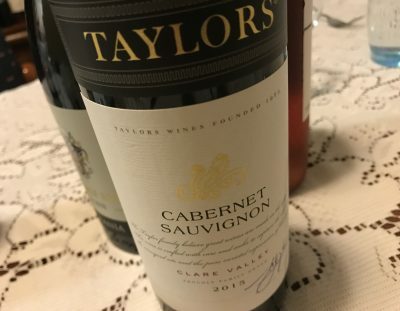 Typically this is Taylors best standard ‘Estate’ wine, their push forward to show that the Clare Valley does Cab better than Shiraz (it does. You know it). Dark colours and dark berry fruit with licks of mint and bark. No missing the story here! It’s typical Clare Cabernet. Tastes it too – ripe, young, blackberry flavoured. There’s a suggestion of odd sweetness through the middle – a little grape concentrate? – before a slightly astringent finish. The key appeal is how much hearty Cabernet you’re getting for the dollars. That raw finish and sweetness contrast is a little distracting, but the depth of flavour carries the whole wine forward, and the gruff Cab tannins will hook in many. Value drinking if you can pick it up for sub $15. Best drinking: 2017-2025. 16.5/20, 88/100. 14%, $20. Would I buy it? Not quite my bag. but it’s ok.